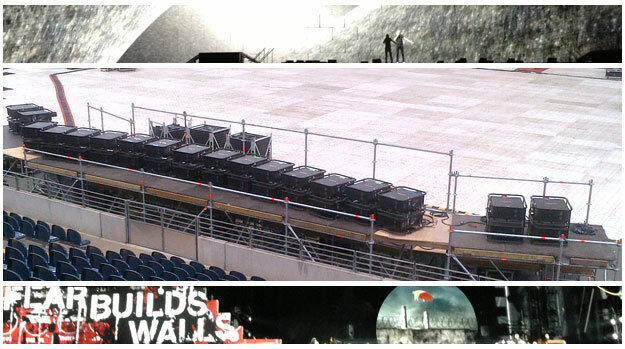 XL Video and Roger Waters' ‘The Wall Live’ Concert Tour use Panasonic Projectors to create a spectacular stage wall. XL Video are the multi-award winning AV experts responsible for the projection of Video Director Richard Turner's innovative video display on Roger Waters' ‘The Wall Live’ concert tour. To help XL Video bring the shows to life, forty units of Panasonic twenty thousand lumens PT-DZ21KE and PT-DS20KE projectors are being installed into the grand scale stadiums and arenas, as the musician delivers twenty-seven electrifying rendition performances across Europe running until autumn 2013. Roger Waters comments on the technology of the show; “This wide wall stadium show couldn’t have been done 40 years ago. We couldn’t have filled the space in a way that would have been emotionally, musically and theatrically satisfying. Technology has changed. Now we can.” The Panasonic PT-DZ21 models project exceptional brightness levels and crystal clear imagery onto the colossal 20,000 square feet of wall, delivering a state-of-the-art visual spectacular, celebratory of Pink Floyd’s iconic stage concept.